Eliza Sydnor Romm is a rising star in the dressage world. 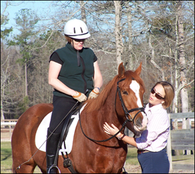 She epitomizes a classically trained dressage rider, trainer and instructor. She is a successful competitor and a sought-after trainer. In 2007 Eliza made history by becoming the youngest person in the United States to receive her USDF Training-Fourth Level Instructor Certification. Eliza is the daughter of Cindy Sydnor, a well respected dressage trainer from North Carolina who was long listed for the USET from 1976 – 1979. Eliza became interested in dressage very early in life, and she was fortunate to receive excellent daily instruction from her mother. Cindy is known as a classical trainer who learned from Karl Mikolka, Bengt Ljungquist, and Walter Zettl. Cindy instilled a powerful appreciation of theory and true “basics” in Eliza. Eliza then went on to be a working student for Jennifer and Beth Baumert, Lilo Fore, and Klaus Balkenhol. All of the above trainers taught her a great deal and allowed her to develop her skills as a true trainer rather than just a rider. Since 2004, Eliza has trained with Scott Hassler as often as she can. Scott has helped to improve Eliza’s riding in all areas and has given her more confidence as a trainer and instructor. Eliza has competed successfully through the Grand Prix. All the horses she has competed on throughout her life have been trained exclusively by her. She has had wonderful opportunities to learn from a few schoolmasters, but she always found the greatest pleasure in training her own horses for the competition arena and developing that special relationship over time. One of Eliza’s specialties is working with young horses. She has started close to 50 young horses under saddle, prepared and won 5 Mare Performance Tests with young mares for the American Hanoverian Society and/or Oldenburgs, started and trained four young horses for the FEI Young Horse Tests, and been selected nine times to participate in the Young Dressage Horse Trainers Symposium. Eliza was also selected to be a demo rider, on her then 4 year old mare, in the USDF Symposium with Christoph Hess and Steffen Peters. As a young rider, Eliza was selected for the Olympic Dream Trip, a phenomenal scholarship program offered by The Dressage Foundation. She then went on to lead that trip twice. In 2015 she received a grant from Harmony Sporthorses to travel to Germany to train with Oliver Oelrich. Eliza has a strong belief in giving back to the dressage community. 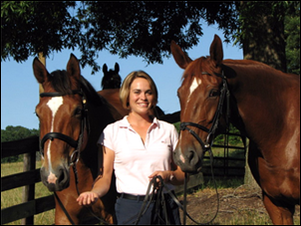 She serves on the board of The Dressage Foundation and has previously been chair of multiple committees for NCDCTA. 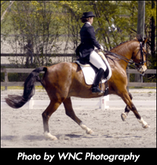 She frequently writes articles for Dressage Today, USDF Connection, the local NCDCTA newsletter, as well as many others. She teaches frequently in the local Pony Club and loves mentoring young people who are fascinated by dressage and horses in general. Please browse through the site to learn more about Eliza and the wonderful horses in her life. You can also become a fan on Facebook! Just search for Eliza Sydnor Dressage and follow along with regular updates.